This pattern has 10 pages of photos, and written instructions so you can do it quickly. 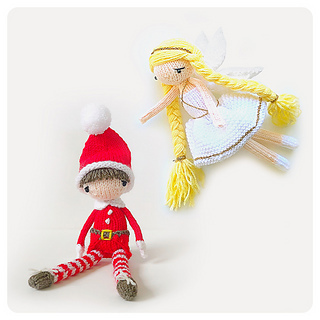 It includes both the Christmas elf and fairy. 8 ply weight wool or acrylic. (I have used Moda Vera Marvel 8ply 100% acrylic for MC, CC1, CC2 and CC3) Yarn in beige, red, white, brown, yellow and gold.